Cub Scouts make new friends and learn new tings in an environment designed to help them succeed. Boy Scouts dive into outdoor adventure relying on teamwork and character to guide the way. Venturers travel to new places, meet new friends and take adventure to new heights. 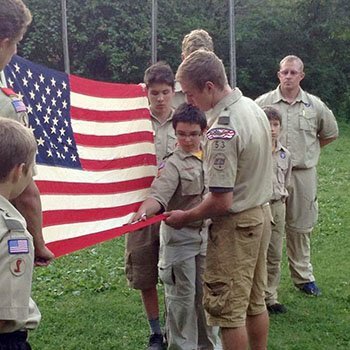 Parents, scouting provides programs that build character, foster mental and physical fitness and teach citizenship. Whether it’s an adventure in the outdoors or learning about careers through hands-on experiences, Scouting is about spending quality time with peers, family, and other caring adults. For over a hundred years spanning 6 generations, the Boy Scouts of America has existed to provide a program to develop strong, well-rounded citizens from the youth of this country. That objective hasn’t changed. 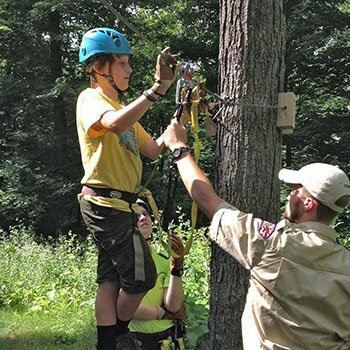 Through organized, age-appropriate activities, Scouting provides skill-development opportunities your child might not otherwise find at home, school or through other extracurricular programs, including leadership, team building and conflict resolution. Scouting also builds character by developing confidence and self-reliance through positive role models as your child matures. The 12 traits that make up the Scout Law read like every parent’s wish list for their children (see leaf ). Along with the motto of “Be Prepared,” and the Scout Slogan “Do a Good Turn Daily,” Scouting sets expectations of cooperation, respect and goodwill—all success factors in helping build lifelong personal and family values by reinforcing ethical standards. The overwhelming majority of men who were Scouts agreed that the values they learned in Scouting continue to be very important to them today. Scouting is anything but a self-contained environment. Its connection to the community is absolutely vital.Each Scout unit is chartered to a community organization that provides the unit with a place to meet, leaders and guidance. Community service projects are a requirement of every Scouting program. These projects find the Scouts and leaders working side by side, often earning the funds to offset their dues and other expenses throughout the year. Do leaders have to pay dues? Yes – membership dues of $24 / year. Income from other sources, including United Way, bequests and individual contributions, help provide additional support like leadership training, outdoor programs, council service centers and camps. Parental involvement is one of the strengths that makes Scouting unique. Currently, there is one registered adult volunteer for every three Boy Scouts. You will appreciate getting more involved at different times and levels during your child’s Scouting adventure — whether it’s organizing a meeting, cooking for an event or teaching for one of the many merit badges. Your investment will be rewarded with an experience that is unmatched in the difference it can make in your child’s life, as well as your own . . . and it’s fun! Siblings and extended family members can also benefit by participating in family-based activities and programs, and a Scout can serve as a positive role model to younger family members. Scout parents are available and present in their children's lives while working to be a positive role model.